As promised, I am hosting my first giveaway! 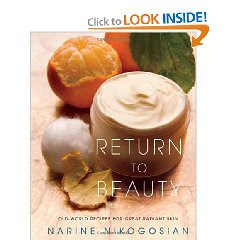 I received "Return to Beauty" by Narine Nikogosian when I won it in a giveaway from another blog. I absolutely loved this book and I decided it would be perfect for my first giveaway. Therefore, I bought another copy to give to my readers. Return To Beauty is a book full of wonderful Eastern European traditional skin and hair care recipes that can be made with simple things you have in your kitchen (lemon juice, water, honey, etc). What I loved the most about this book is that it has an Astrology section. Not only does it tell the typical things about your personality, but it says what foods are appropriate for your sign. I found it entertaining and accurate! The book also contains different recipes for different seasons, a pregnancy section, recipes for acne and dandruff and even a section for men. I literally sat down and when through this book for hours when I first got it. I have only tried one of the recipes so far, but I plan on making more this weekend. I hope you will enjoy this book as much as I do. Tweet about this Giveaway (can do DAILY). You can copy and paste this " @Latsyrc728 has a "Return To Beauty" Giveaway www.thriftyandfrugalliving.com #giveaway ends 02/01"
That is it! Simple. Just leave a separate comment for each entry and make sure you leave an e-mail address to win. Winner will be chosen randomly. Giveaway ends 02/01/10 at midnight. Winner will be e-mailed and have 48 hours to respond before a new winner is chosen. I'm following you both ways! Thanks! Following via Google Connect, Facebook and Twitter. I am following you with Google friend connect and found your site via the Friday Follow event. Found you through Friday Follow! Following you through GFC. Thanks for linking up at Friday Follow. I am following via Friday Follow! This book looks fantastic. I use a homemade sugar scrub and love it. I just found your blog through Follow Friday. I am a new follower. Great giveaway. Thank you for joining the Follow Friday. I"m following you now. Looking forward to getting to know you. Follow by Google Friend Connect. @Latsyrc728 has a "Return To Beauty" Giveaway www.thriftyandfrugalliving.com #giveaway ends 02/01"
i now follow you on google friend connect! i really want to win this book! I am following you on Twitter. This looks like an amazing book!